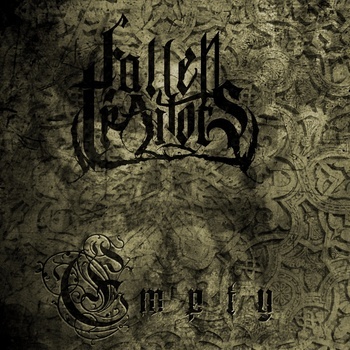 Fallen Traitors’ debut album Empty is eight tracks long and has about 35 minutes worth of material. It has a very old school death metal/old school heavy metal feel to it. This can be heard as soon as you start the album. “Sand Trap” is the first song off of this album. It starts with an upbeat rhythm with guitars, vocals, and drums working in sync. It also has a groove metal influence, that can be heard throughout the whole song. The vocals on this track are regular screams, not typical -core screams. It has a guitar solo at 2:00 that is probably the most stand out thing about this song. It lasts until 2:45. The following song is “Behind Walls” and it starts out with a heavier tone with guitar chugging and low screams. The vocals transitions from low screams to clean singing. The singing is similar to how the singing was in heavy metal a decade or two ago. Clean singing is the primarily vocal technique used in this song, as the screams are from backing vocals from the guitarist. This song strays far from death metal and keeps in the heavy metal type of sound and pace, except with some added screams here and there. There is a melodic guitar part near the end of the song that finishes off the track. Empty is an okay album. It really isn’t something I would personally listen to, but I am sure there a lot of people out there that would enjoy it. It is more heavy metal than thrash or death metal, and the audio quality could use some improvement. Also, the vocals could be improved, at least with the screams (I didn’t really like the screams in “Sand Trap”). Not related to the album or the band really, but they do not have Empty up anywhere to download or purchase, which I think is counterproductive for a band. It should be somewhere to purchase or download if they want to progress in the metal scene. Anyway, if you’re into heavy metal with some death metal influence, give Empty a listen! ‹ Garage Agency Presents Death To The East!